Bears: Should you be afraid? What are your odds of being killed by a bear? Incredibly low. So low that it's not something to worry about. What are the facts backing up that statement? Since interest, or perhaps morbid obsession, with fatal bear attacks is so high, Wikipedia actually gives a reasonably good idea of the recent numbers because people rush to list "another bear attack." According to Wikipedia, in the 2000's black bears killed 15 people in NORTH AMERICA (including Canada, the U.S., and Mexico.) Grizzlies killed 12 people during that same period, for a total of 27. For the 90's Wikipedia lists 23 fatal attacks. 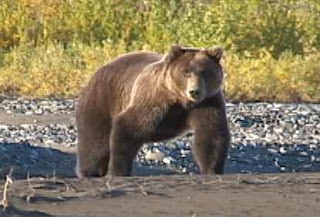 Dr. Stephen Herrero, a leading authority on human/bear conflicts, says 29 people were killed by bears in North America in the 1990s. In other words, less than three people are killed in North America by bears each year over the last 20 years. And that includes all the countless people in all of the most theoretically dangerous places: Yellowstone, Denali, BC, Alberta, the Yukon, Glacier. With about 16,929 murders a year in the US and Canada combined out of a total population of about 334,000,000, about 1 out of 19,625 people will be a murderer in a given year. With about 3 fatal bear attacks per year in the US and Canada combined, and about 660,000 bears in the US and Canada total, about 1 out of 220,000 bears will be "murderers" in a given year. 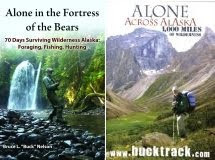 In Stephen Herrero's great book Bear Attacks: Their Causes and Avoidance (revised edition) he says this: Bear attacks are rare events. I told her that in North America there are an estimated six hundred thousand black bears and sixty thousand grizzly bears. Each year there are millions of times in which each species is close to people and no threat or injury results... I hate to see people's lives crippled by fear based on ignorance. If you like this post, I hope you'll click the "Like" button below, and spread the word! Your comments and suggestions are welcome.